The main a/c on our 2016 38RD simply isn't getting the job done. Our 5er is parked beside our house in Central Texas while we get ready for our first major road trip with it. The daily temps are in the low 90s, but the living room a/c only brings down the living room temp 14-15 degrees. Yesterday it was 92 outside, and 78 inside. The bedroom a/c works as expected. If the thermostat says 74, that's what the room temp is. The living room thermostat usually reads higher than what the actual temp is, and turning it down to 68 still only gets it into the upper 70s. The trailer does sit broadside to the evening sun, but solar screens and blinds are kept down, and the a/c is kept on all day to get a head start on the evening sun. I also have two vents from the the bedroom and bathroom turned into the hallway to help out in the living area. No cooking is being done to raise the temps. I've heard that typical fifth wheels can only be kept about 20 degrees below ambient, and I found that to be true with our previous 5er. When we parked our Chaparral 36 on an asphalt lot in Las Vegas, with the sun beating down from dawn til dusk, it would stay 80 when it was 101 outside. So why isn't my higher-end "Residential Vehicle" doing much better than an entry level "Recreational Vehicle"? Check the discharge temperature at one of the A/C outlets. Should be about 55 F. If close then check for any blockage in the duct work beginning at the A/C unit. Many have reported finding blockage at the A/C unit. How many ACs do you have 2 or 3?? you don't say. We have a 2015 38GK and we can bring the temp down to 65 when it is 95+ outside. We usually keep it at 70 to 72. Are your fans on high on each thermostat?? If they are not on high they can freeze up. Are all the returns open?? Is the air really flowing?? The return filters are they clean?? the black foam things can get really dusty. The temp should be about 20deg+ difference from the room temp coming out of the round vents. Is the front closet closed. cause the heat loves the front cap. Without a generator to pre-cool the rvm what we found was no matter what we did, it would take 4 to 6 hours to cool down the 5'er initially, but after that it could keep up ! we tried leaving slides in, covering windows, fans, leaving residential freezer open nothing seemed to help, so we would plug in, turn ac's on full blast and leave until the sun went down that first night. 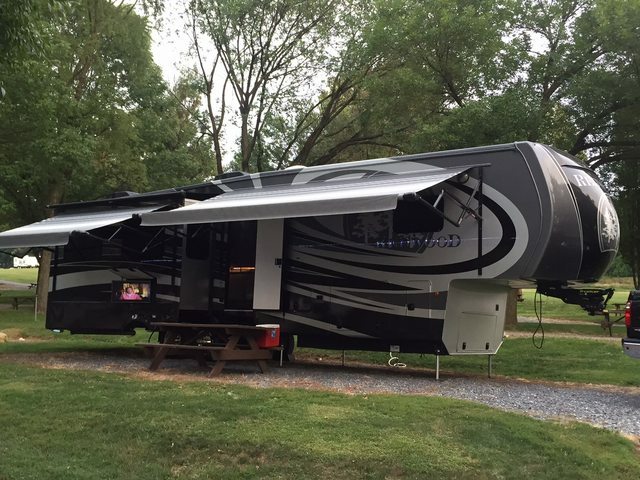 Our unit is a 2016 model (but built 10/7/2015), and has two roof units. They are both Coleman Mach a/c's and are apparently both 15k heat pumps. I say this because they appear identical, and the manufacturer's equipment list says it has "30,000 BTU a/c". Ted 95, the filters are clean, and air is blowing from every vent. The fan is on low in the bedroom because that unit doesn't have any trouble keeping the front of the trailer cool. The closet door is open (because I'm lazy) but it has it's own a/c vent in it, so it stays plenty cool in the cap area. Right now it is 90 in the shade outside. The bedroom thermostat is set at 74, it says it's 74, and that is what my handheld thermometer says is the actual temperature in the bedroom/bathroom/closet area. Ahh, but the kitchen/living area! As I said, it's 90 degrees ambient outside, and 106 when the thermometer is placed in the direct sun. The rear unit thermostat reads 83 right now, even though the a/c is set to 66. The fan is on high. My handheld thermometer says it is 79 here at my easy chair, and the a/c has been running around the clock. That's as good as it gets in the evening. Johnboytoo, our unit is stationary and I'm staying in it full-time, so the a/c's run all day. I hate to think what it would be like to pull into Vegas in the heat of the day and have to open the slides and try to cool it down when it's 100+ outside! Here in Texas it still drops into the 60s at night, so in the morning the whole trailer is cool & comfy. It doesn't get any morning sun because of a hill, and it stays comfortable until after 2 pm when the sun passes over and hits the broadside of the trailer. Then the temps climb to uncomfortable levels, even though I've been "pre-cooling" the trailer all day. RCAircraft, I'll have to get a tester to get accurate temps/flow rate. My "open palm test" indicates pretty uniform flow, but I doubt it's blowin' at 55. More like 65, I'd guess. Have you checked how far the ac collars go inside the ducting? A lot on here had to trim them back ( including me ) because they were 1" or more too long. I did that and noticed a big difference. My unit is black, and i am able to keep it in the low 70's on a hot summer day with no shade in Florida..
Ford truck guy, I haven't tried any troubleshooting yet, I'm still trying to figure out where to start looking. We bought the trailer four months ago, so I'm still getting to know it. I don't want to do anything to violate the factory warranty, but I also don't want to have to make an appointment at the dealership, then haul it 45 miles and leave it while they spend days working on it. I like to do my own repairs when possible, so I appreciate all the info you guys are giving me. I know, I know, but to keep cool, I sure would ! As Joe (Ford truck guy) said, remove all your outlets & check the height of the collar & depth of the duct, if I were to guess you'll find a 1 1/2" collar in a 2" duct so essentially they block the duct , several have trimmed them down to let air flow by. I would also turn both units to high fan & add a couple small fans to move the air around. Also the gasket between the return air plenum & the output in the unit on the roof has probably slipped out mixing outside warm air with the cool. You'll have to remove the a.c. cover & several screws on the metal cover to inspect that gap, I along with others put the foam gasket back & covered the gap with a.c. duct foil tape. Last fall when we arrived in Arizona early afternoon it was 114 outside & 94 inside once setup & it took about 1 1/2 hours to get to the 74 I had set the thermostat at. one other thing - do you have halogen or led light bulbs ? AMAZING the amount of heat those little halogens produce !